I suppose, technically speaking, my concoction is really a flaugnarde (pronounced flo-nyard). 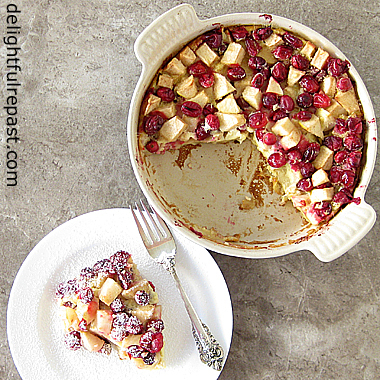 But Julia Child, in Mastering the Art of French Cooking, just called all the variations clafoutis; and that is good enough for me. 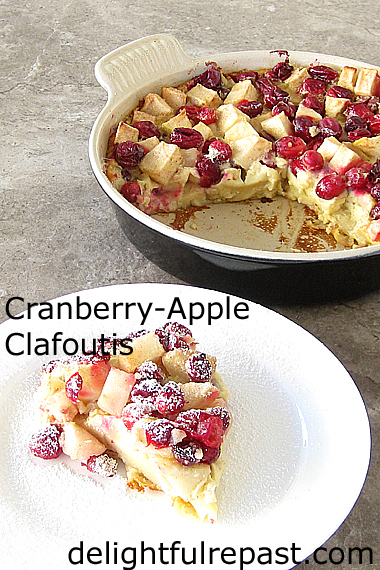 If you’ve not had clafoutis, you might be surprised by the texture. Not a cake, not a custard, perhaps something in between? The simple French dessert is basically a thin crepe batter poured over fruit and baked in the oven. 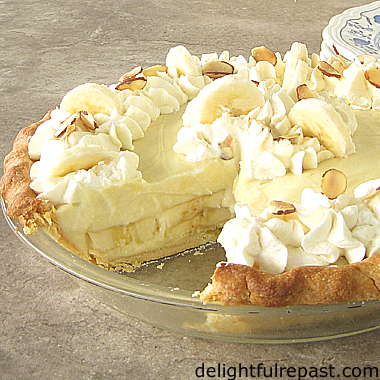 It’s such an easy dessert, but let me tell you, it could have been a disaster! You can use any shape dish you like, but I wanted to make it round (because, like Jacques Pepin, I think clafoutis should be cut in wedges) and narrowed it down to two dishes: a vintage Le Creuset enameled cast iron and a Pyrex. I went with the latter, for no particular reason. You can use one of two methods: Put the fruit and all the batter into the buttered dish before it goes into the oven or lightly bake a thin layer of the batter before adding the fruit and the rest of the batter. I went with the latter because it’s supposed to make for tidier slicing and serving. It wasn’t until I pulled the dish out of the oven with its lightly baked thin layer that the light bulb went on. You can’t add cold fruit and cold liquid to a hot glass dish! So I grabbed the Le Creuset and transferred that layer into it. Whew! That could have been a disaster! The clafoutis was delicious, but I just had to make another one to see if that extra step of baking a thin layer of batter was really worth the trouble. And I used the Pyrex dish, for variety. The verdict? No, that extra step is not worth the trouble. 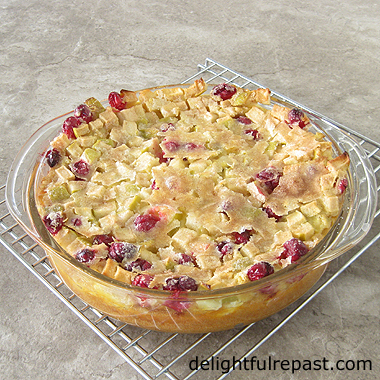 The second clafoutis, with all the batter going in at once, seemed to form its own little “self-crusting” layer. 1 Preheat oven to 350F/180C/Gas4. Butter a 2-inch/5 cm deep 8-inch/20 cm round baking dish* with the 1/2 tablespoon softened butter. In a small dish, melt the tablespoon of butter and leave to cool slightly. * I just learned this item is no longer made by Pyrex and can only be found on the vintage market. I think what would be even better, ideal, for this dish is the Pyrex Easy Grab 9.5-Inch Deep Dish Pie Plate, and I plan to order one. 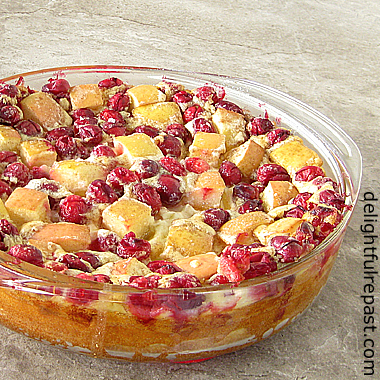 2 Spread cranberries and apple cubes in prepared dish in a single layer. Stir together 1/4 cup sugar and cinnamon; sprinkle evenly over the fruit, holding back 1 tablespoon to sprinkle on the top. This photo shows why I decided to hold back a tablespoon of cinnamon-sugar to sprinkle on the top before baking. See how crackly and pretty it is. Also, for this one, I cut the apples into smaller 1/3-inch dice. Either way, 1/2-inch or 1/3-inch, is good. 3 In a 1-quart glass measure, whisk together the eggs, remaining 1/4 cup sugar, melted butter, brandy, vanilla extract and salt. Whisk in the flour and then the milk, adding it gradually at first, to make a smooth batter. If it’s not as smooth as it should be, you can hit it with an immersion blender. Don’t drag out your blender for this one; a whisk will get the job done. 4 Pour the batter over the fruit. Sprinkle on the reserved tablespoon of cinnamon-sugar. Bake for 45 to 50 minutes, until puffed and golden and browning around the edges and pulling away from the edges of the pan. 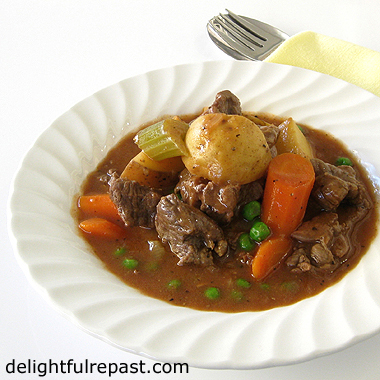 Slow Cooker Beef Stew was the first thing I wanted to make in my new Instant Pot. Yes, folks, I finally broke down and bought one. I didn’t have room for one more countertop appliance, but I needed to replace my slow cooker’s cooking pot. Here’s the story. I love my slow cooker, the Cuisinart 6-quart multicooker slow cooker, but I damaged the nonstick surface of the cooking pot and so was going to have to order a replacement. Since I was interested in trying a pressure cooker, I thought I’d try the combination slow cooker pressure cooker Instant Pot with its uncoated stainless steel cooking pot. This photo shows how I protect the wall and undercabinet lighting from grease spatters with a dish towel when sauteeing in a countertop appliance. Or I can set it on something on top of the stove and turn the range hood on. This time I used packaged grass-fed stew meat, but I really prefer to buy a piece of chuck (about 2.75 pounds) and trim it and cut it up myself into larger pieces. I’ve written my recipe instructions for the cook who is new, as I am, to using the Instant Pot as a slow cooker. If they are not clear, do tell me so that I can clarify them. 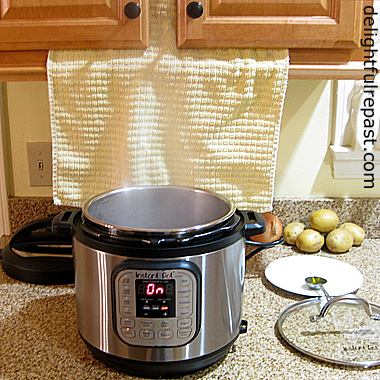 Anyone using a regular slow cooker (or the stovetop) can easily make adjustments. Then I’ll try out the Instant Pot in its main function as a pressure cooker. I’m brand new to pressure cookers, probably because my mother and grandmothers didn’t use them, so it’s going to be an adventure. Have you jumped on the Instant Pot bandwagon yet? I think I might be the last person on the planet to get one! 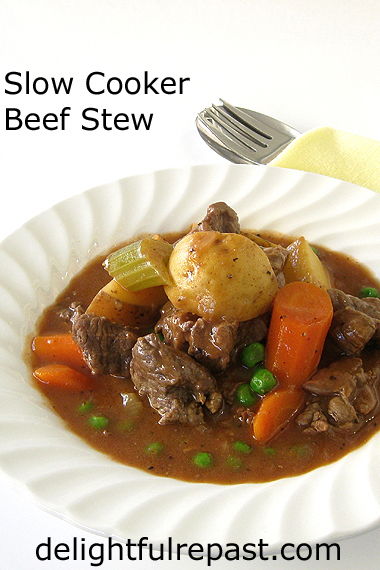 Update 01/17/19: Pressure Cooker/Instant Pot Beef Stew, Classic Stovetop Beef Stew. 1 Brown the beef in two or three batches. (I do three because I’m really into thorough browning.) Plug in the Instant Pot. Select the Saute program. Press the Saute key again to go from Normal temperature to More. When the word Hot appears on the display, add 1 tablespoon of oil to the stainless steel cooking pot of the Instant Pot. 3 Deglaze the cooking pot with 1/2 cup wine or water. Press the Cancel key. Add the beef back to the Instant Pot, along with all remaining ingredients except the slurry and garnish. 4 Put on the optional Instant Pot glass lid, or use the pressure cooking lid with the steam release handle turned to Venting. Select the Slow Cook program. Within 10 seconds, press Slow Cook to set temperature to Normal. Within 10 seconds, press “+ or –“ to set time to 6 hours. Note: Instant Pot users have reported all kinds of timing differences in the slow cooker function, so you’ll just have to see about this! 5 After 6 hours (if your stew is done), shake together flour and water until mixture is smooth. Stir the smooth slurry into the stew, taste and adjust seasoning; press Saute and continue cooking, stirring occasionally, for 5 minutes to thicken. Remove bay leaf, and sprinkle on parsley or stir in frozen peas. I should be a judge or something on the Great British Baking Show—British baking has been my schtick all my life. And here I go with a biscuit (cookie) from Southern England. This isn’t a family recipe. My only connection to Devon is that 13 of my ancestors on my father’s side came over on the Mayflower from Plymouth. I’ve had biscuits/cookies made with clotted cream and butter before, but they were from Cornwall. I only learned about this traditional all-clotted cream Devon version when I read a post about Devon Flats on the charming food blog As Strong As Soup. The recipe was in print as early as 1935 and most are very similar and call for the dough to be cut into 7 or 8 cm/3-inch rounds. I wanted them a bit smaller for afternoon tea and used a 5 cm/2-inch round cutter. The clotted cream can be store-bought (difficult to find in the US, though) or mail-ordered (clotted cream on Amazon), or you can make my authentic Homemade Clotted Cream, which I did the day before I made the Devon Flats. 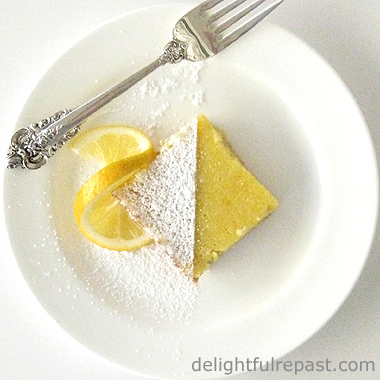 You might think this plain little biscuit would taste no different from a regular sugar cookie made with butter. 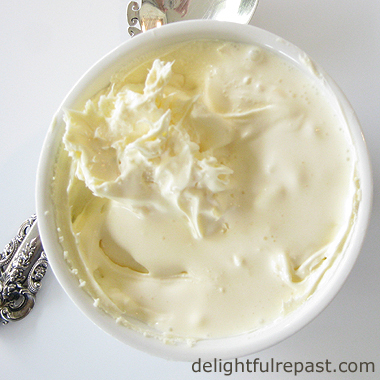 But if you’re a clotted cream aficionado, you know that clotted cream and butter taste quite different. 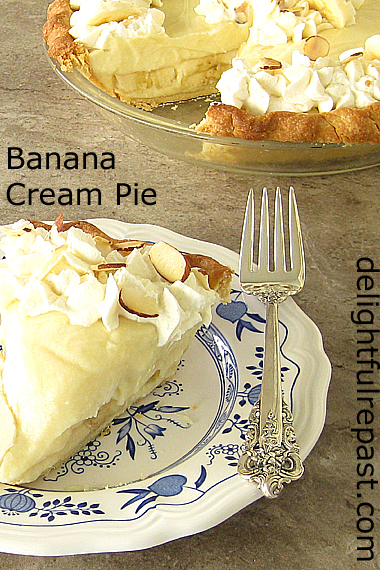 I resisted my natural inclination to add vanilla extract or citrus zest or spice, knowing I'd be rewarded with the pure clotted cream flavor. 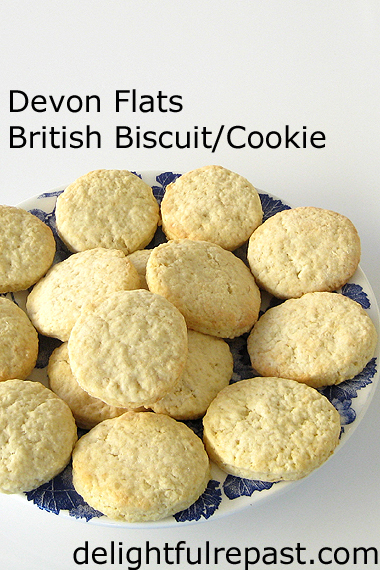 Most Devon Flats recipes call for self-raising flour (called self-rising in the US), but I always use plain flour (called all-purpose in the US) and so have added baking powder and salt to the recipe. Since British self-raising flour is not the same as American self-rising flour, it makes much more sense for me to make my recipes with plain/all-purpose. The recipes I looked at measured the clotted cream “or thick double cream” in “ml” rather than grams, so I’m assuming those bakers were using a much more liquid product than I. I used clotted cream, which is quite solid, so needed to add more liquid. The recipes called for rolling out the dough anywhere from Phil’s “thinly” to 1/4 inch, 1/3 inch, 1/2 inch and even an absurd 1 inch. I rolled this batch to 1/4 inch but next time will do 1/8 inch, which is what I imagine Phil’s “thinly” to be. And that will mean more biscuits! And, since my clotted cream is not the least bit pourable, I will change up the mixing a bit, creaming together the clotted cream and sugar, then mixing in the egg followed by the flour mixture. 1 In medium mixing bowl, whisk together the flour, baking powder and salt to “sift” the ingredients. Whisk in the sugar. Note: I plan to change this up a bit next time as mentioned above: Whisk together the dry ingredients. Cream the sugar and clotted cream together. Mix in the egg. Then mix in the flour. 2 With wooden spoon or with hand mixer on low speed, mix in the clotted cream and egg to form a soft, but not wet, dough. If the dough is too stiff, add some milk a little at a time to soften the dough. 3 Cover the dough and refrigerate it for 30 minutes or so. Chilling the dough will make it easier to handle. 4 Preheat the oven to 375F/190C/Gas5. 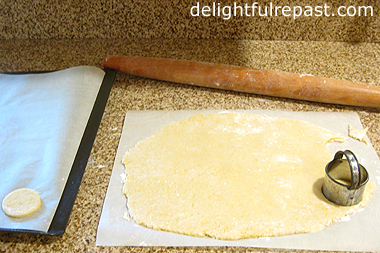 On a lightly floured surface, roll out the dough about 1/4-inch (6 mm) thick and cut out the biscuits using a 2- to 3-inch (5 to 8 cm) round cutter. Note: As mentioned above, I plan to roll the dough about 1/8-inch (3 mm) thick next time. 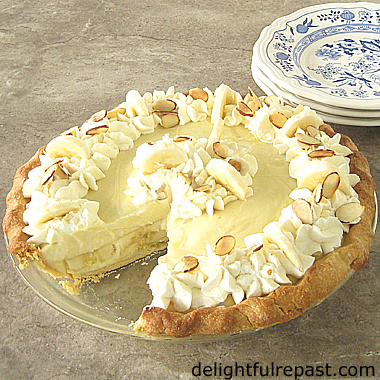 5 Place on lightly greased or parchment-lined baking sheet. 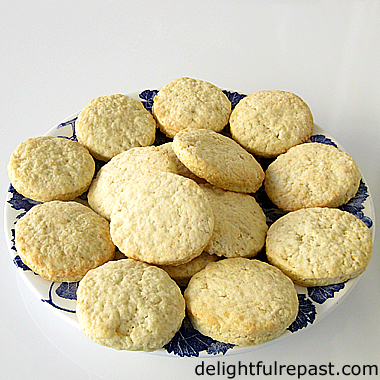 Bake for about 10 minutes until the biscuits are coloring on top and browning slightly around the edges. Cool the biscuits completely on a wire rack and store in an airtight container.